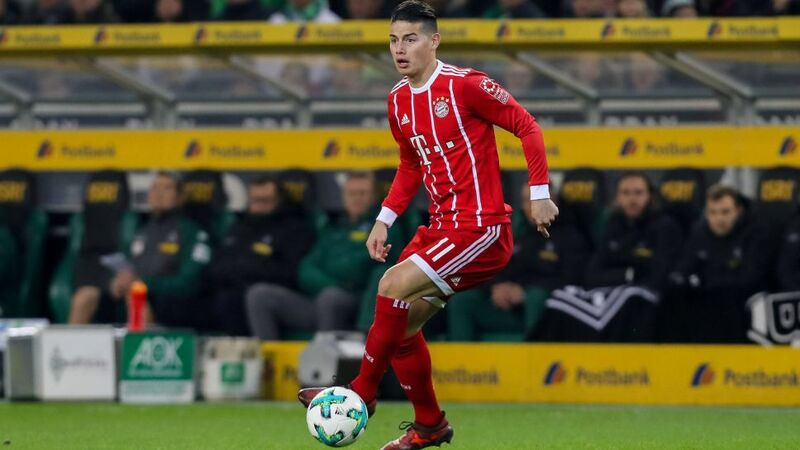 Bayern Munich star James Rodriguez is "feeling better" after suffering a suspected concussion following a collision with Tony Jantschke in his side's 2-1 defeat at Borussia Mönchengladbach. The 26-year-old took a knock to his head after colliding with Jantscke’s shoulder and was withdrawn at half-time as a precaution, with youngster Marco Friedl making his Bundesliga debut as his replacement. "James most likely suffered a mild concussion after the collision," said Bayern coach Jupp Heynckes after the game. "But we have to wait for the diagnosis of the doctors." The Bayern star then gave an update on his injury on Sunday with a tweet, which read: "Quiet Sunday. I feel good and better after the hit I suffered yesterday." There were no immediate signs of serious injury to the Colombia international, but Heynckes was unwilling to risk one of his prized possessions in the second half, despite being 2-0 down to the Foals at the break. Bayern are next in action against Hannover on Matchday 14. Click here for the Borussia Mönchengladbach vs. Bayern Munich match centre!